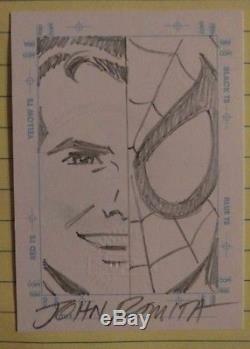 Card is a split-image Peter Parker & Spider-man hand drawn and signed by legendary Spider-man artist John Romita! See photos of actual card. I personally pulled this card in 1998 and have kept it safe in my collection since! Card is in Mint condition and comes from a smoke-free home! Please view my other auctions! 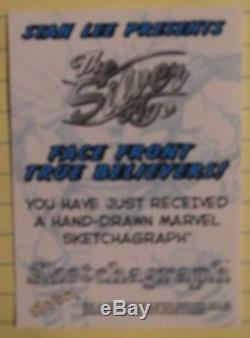 The item "MSA 98 Fleer Marvel Silver Age Sketchagraph RARE Romita Spider-man Split Image" is in sale since Thursday, August 04, 2016. This item is in the category "Collectibles\Comics\Original Comic Art\Drawings, Sketches". The seller is "mroczek" and is located in Plainfield, Illinois. This item can be shipped to United States, Canada, United Kingdom, Denmark, Romania, Slovakia, Bulgaria, Czech republic, Finland, Hungary, Latvia, Lithuania, Malta, Estonia, Australia, Greece, Portugal, Cyprus, Slovenia, Japan, China, Sweden, South Korea, Indonesia, Taiwan, South africa, Thailand, Belgium, France, Hong Kong, Ireland, Netherlands, Poland, Spain, Italy, Germany, Austria, Russian federation, Israel, Mexico, New Zealand, Singapore, Switzerland, Norway, Saudi arabia, United arab emirates, Qatar, Kuwait, Bahrain, Croatia, Malaysia, Brazil, Chile, Colombia, Costa rica, Panama, Trinidad and tobago, Guatemala, Honduras, Jamaica, Ukraine.